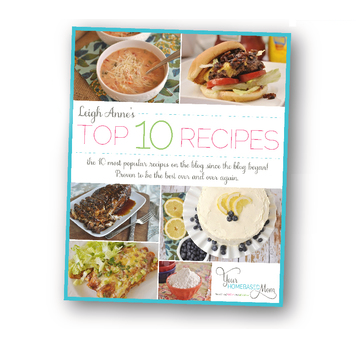 We’re back with our talented group of 10 blogger besties to share June’s themed hop. Head on over to their blogs to see and save their projects after viewing ours. 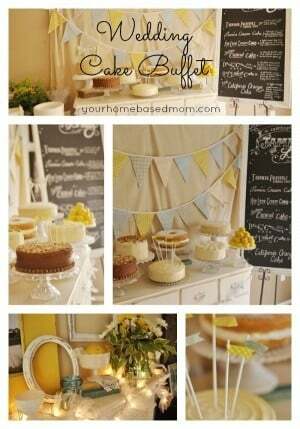 Last month’s hop theme was citrus , so many cute ideas! Pin this collage below, and make sure you come back on the 10th each month! 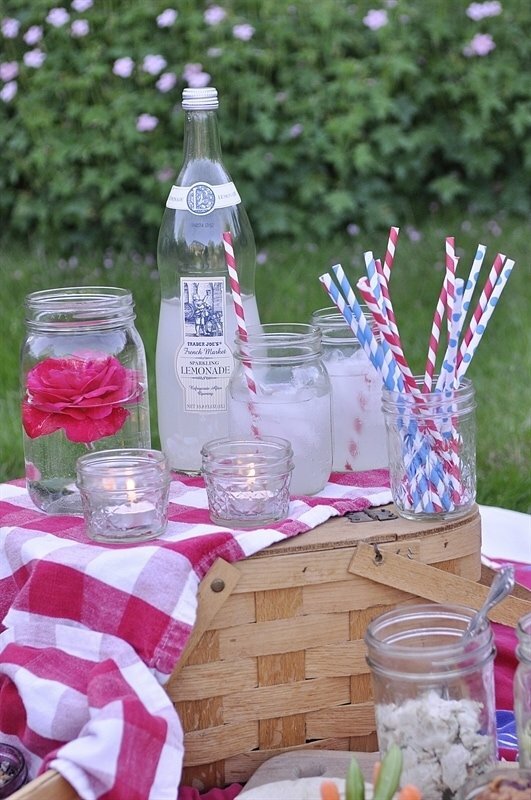 June’s theme is MASON JARS for this beautiful summer weather! 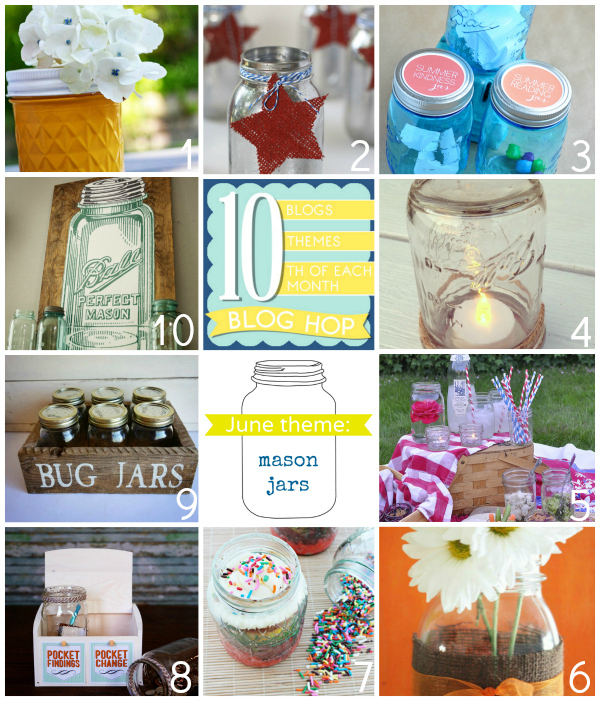 To see each contributors Mason Jar posts up close, join the Blog Hop! Picnic season is here. 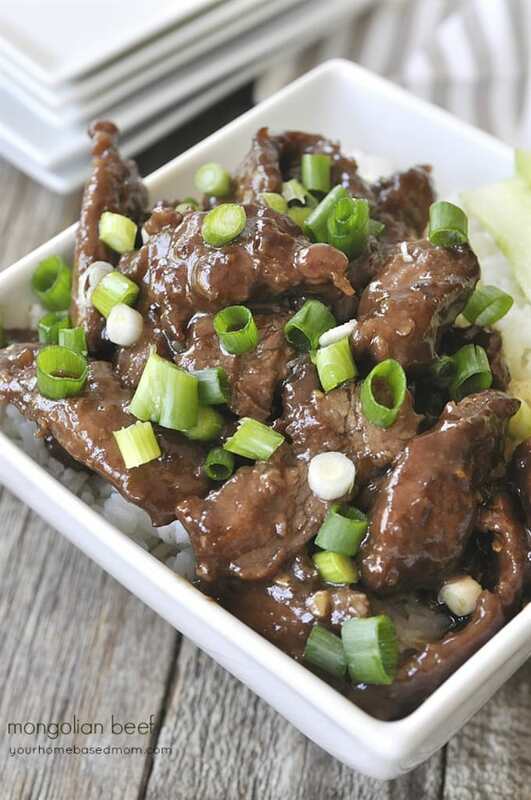 One of our favorite summer activities is to pack up a picnic dinner and head to a local park for a concert or play. Portland has a wonderful program of concerts and plays in their parks each summer. There is usually something going on somewhere almost every night of the week! 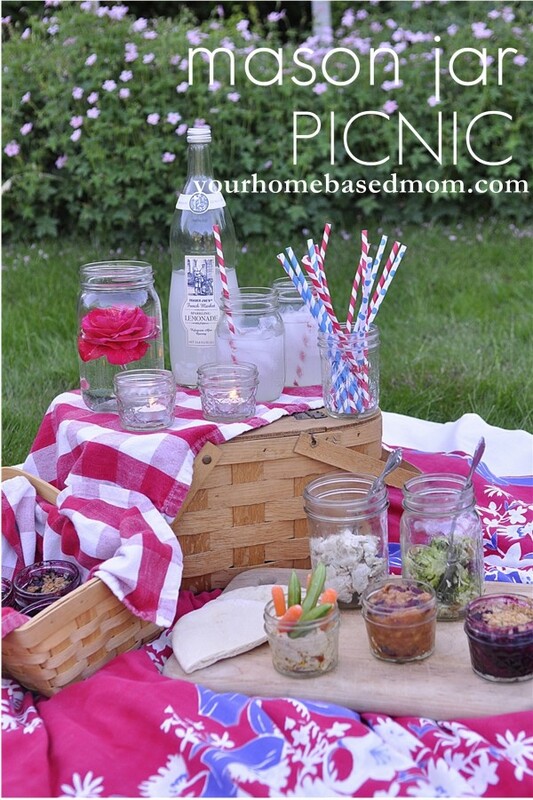 To go along with our Mason Jar theme this month I have put together a mason jar picnic. Packing your picnic is not only easy but it looks dang cute too. Clean up is a breeze also. 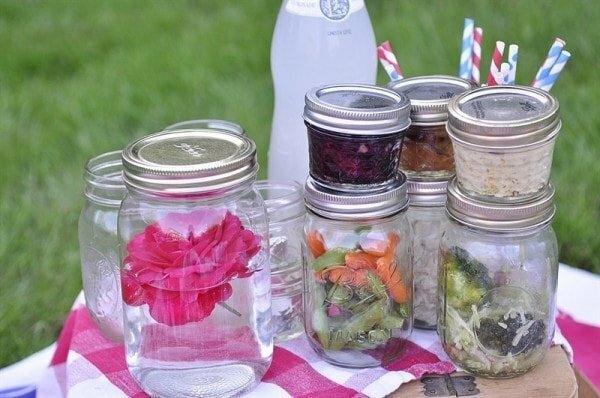 You can basically take any of your favorite picnic foods and just pack it up in a mason jar. 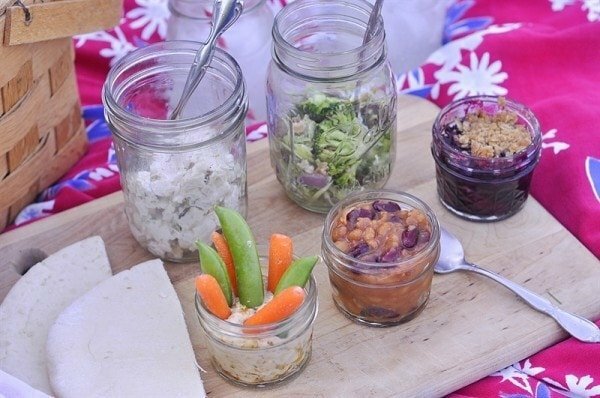 You can use the mason jar as a serving piece or give everyone their own jar and eat right out of the jar. No need for plates. If you are going to eat out of the jar a wide mouth jar is a bit easier but the narrow one will work too. Of course a cute picnic basket and blanket is always nice too. For our picnic I grabbed a few things from our local deli because I am usually planning last minute! I picked up some chicken salad, pita bread, baked beans, broccoli salad and hummus and veggies. 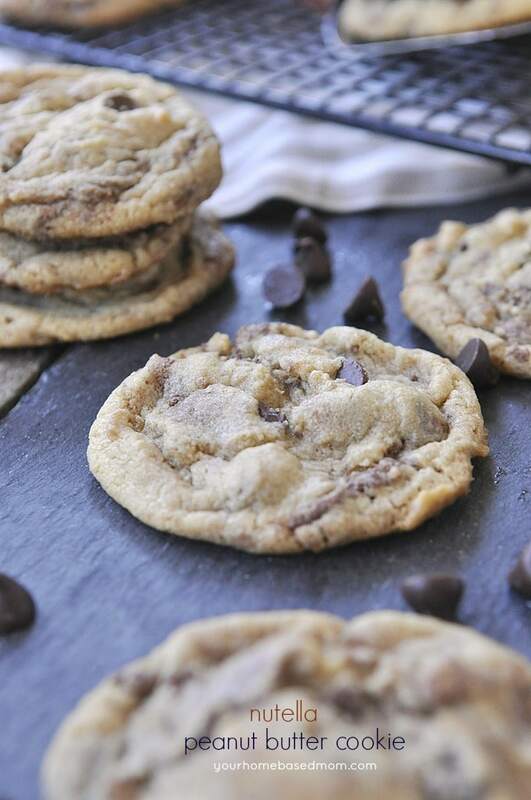 But of course you could make all of these things at home. 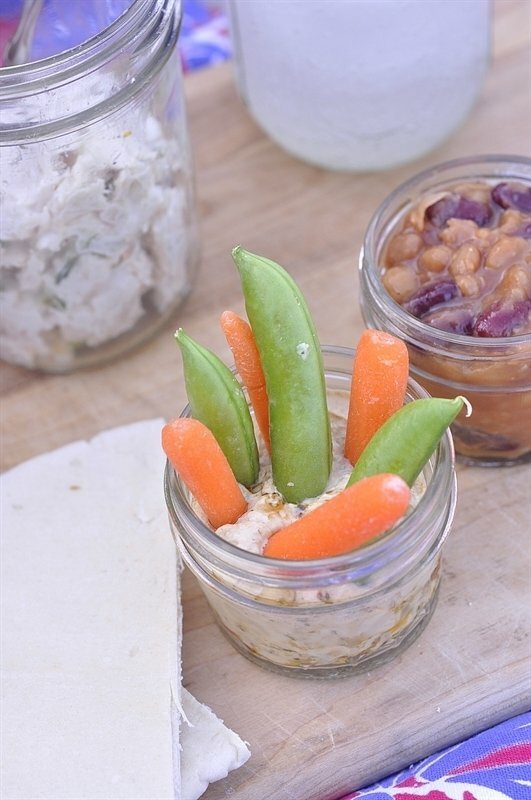 I love the little half pint size jars – perfect for lots of things including dip for veggies. Of course what would a picnic be without lemonade!. We also had to add a little pretty. 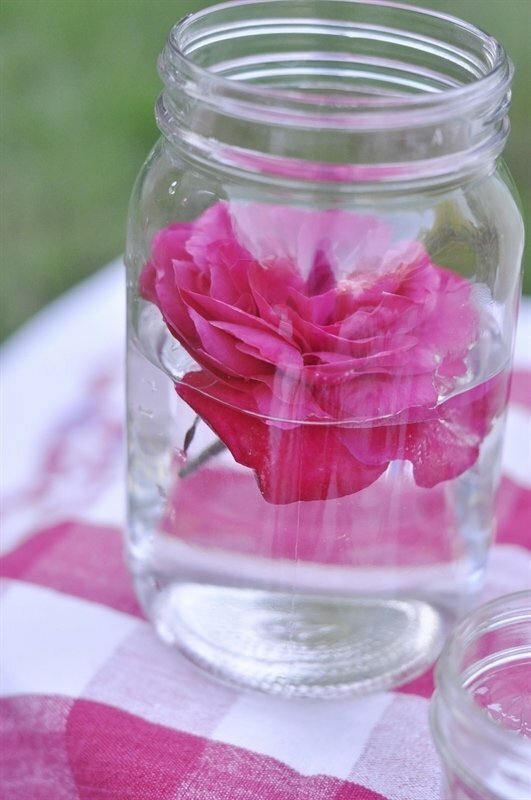 I picked a rose out of our garden and just floated it in some water in a jar – instant centerpiece! And a few tea lights in a jar complete the scene. For dessert I did homemade and I made a fresh blueberry and raspberry crisp. 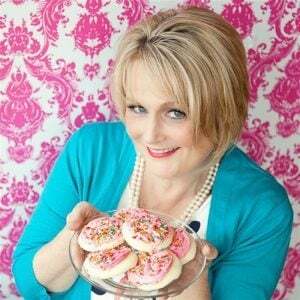 I baked them right in the little mason jars. 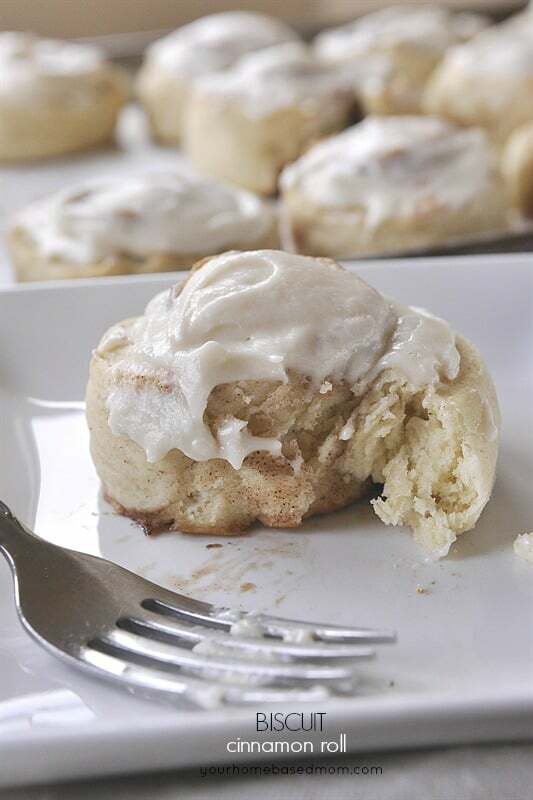 Come back tomorrow for more details and the recipe. 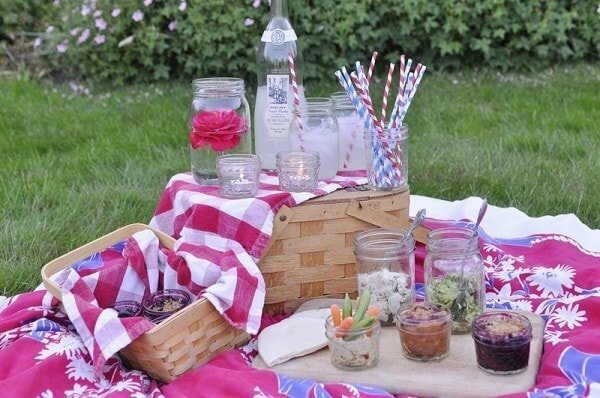 A Mason Jar Picnic is a fun and easy way to put a picnic together. 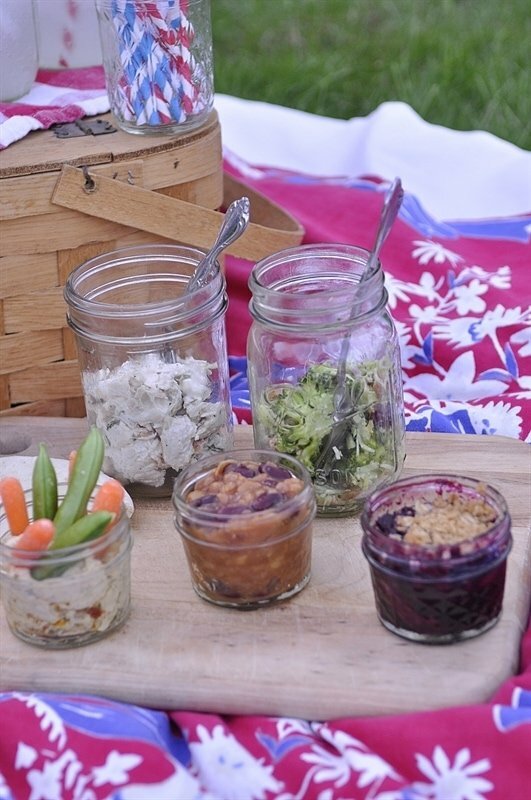 Transportation is easy too – just put the lids on the jars and pack everything up in your cute picnic basket! 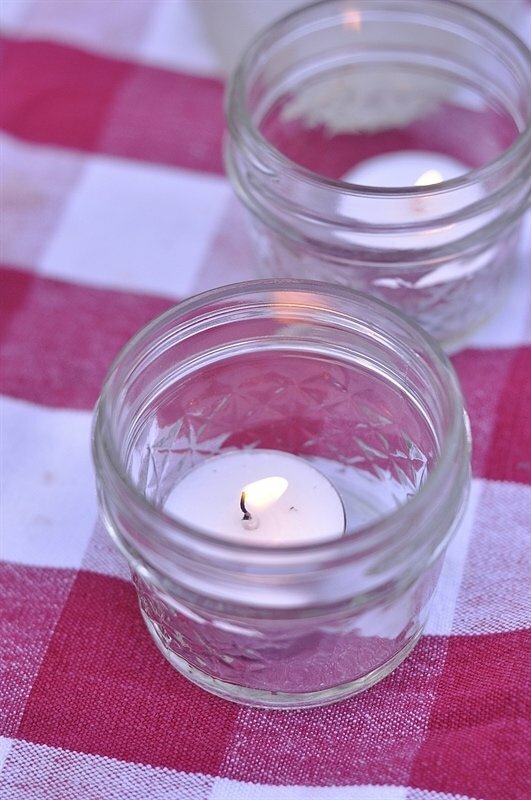 I’m throwing a big picnic for family in a few weeks and love mason jars! Thanks for the great collection of ideas! Have a fun party Ashlee! Glad you enjoyed the ideas. Leigh Anne, Kerr or Ball makes white plastic lids that make it really easy to transport. I found them at Fred Meyer near the canning supplies, but last year I hunted high and low for them. Thanks for the tip Dawn. Need to get some of those! Thanks Kristen! It’s rarely too hot for a picnic around here! That’s why I take my husband along!! 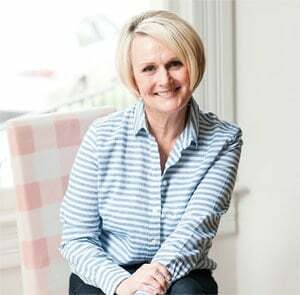 Thanks for the invite – just linked up! That is the cutest picnic idea that I have ever seen! I love it 🙂 We do not have picnic weather here in Iowa, I think I need to move back out west. I grew up in the midwest and don’t miss that humidity. I do miss the fireflies we use to catch in mason jars though! My boyfriend and I had a picnic this past weekend and used mason jars too! I made an amazing raspberry trifle that fit perfectly in a quart size jar! I’d love for you to check it out!! 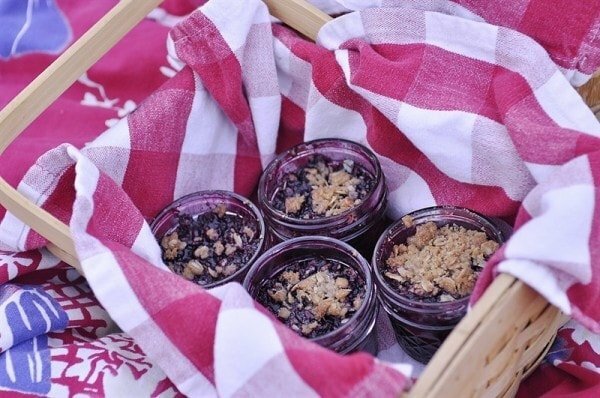 Your picnic looked like lots of fun and the trifle looks delicious! Thanks Heidi, it was fun to put together and the floating flower was my favorite part too! I really really really want to live at your house!!! It’s so pretty and nice and lovely! Thanks Chandra – I have lots of empty bedrooms now!! Thanks for linking to Tumbleweed Contessa. 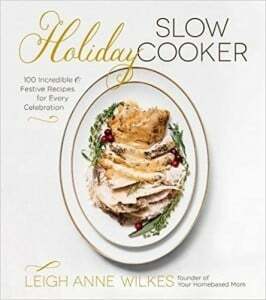 Tomorrow we are hosting Saturday Dishes featuring cupcakes/cakes. Hope to see you. This is my kind of picnic! I love it! Thanks for sharing at Party In Polka Dots! This is adorable! 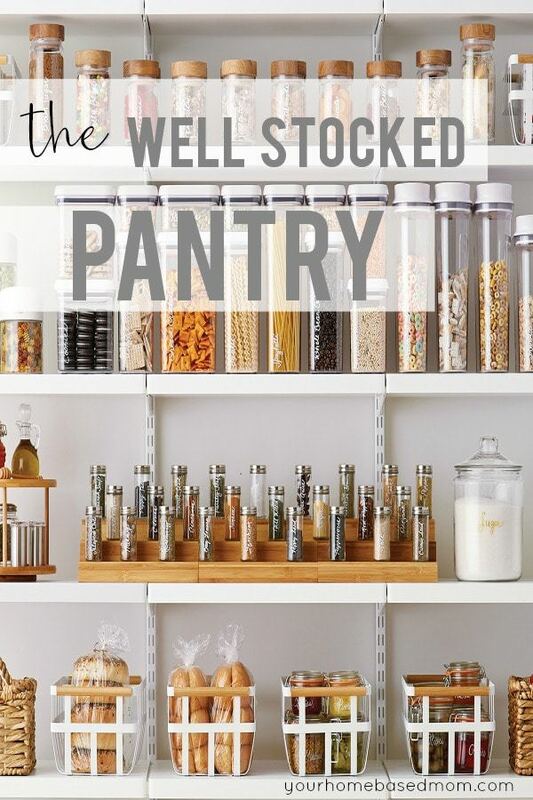 So cute, gave me lots of ideas and I had no idea you can cook in mason jars! Going to have to start stocking up on some. I love your little picnic!! I grew up in Southern California and my parents were big into concerts at the Hollywood Bowl….we always had season tickets with box seats. My Mom and everyone would pack these elaborate picnics, candelabras and all. We would listen to the symphony under the stars with our fried chicken and candles and salads often in mason jars. This just reminded be of it. So cute. My mom grew up in San Gabriel, not far from Pasadena and also went to the Hollywood Bowl. I remember going once as a young girl!